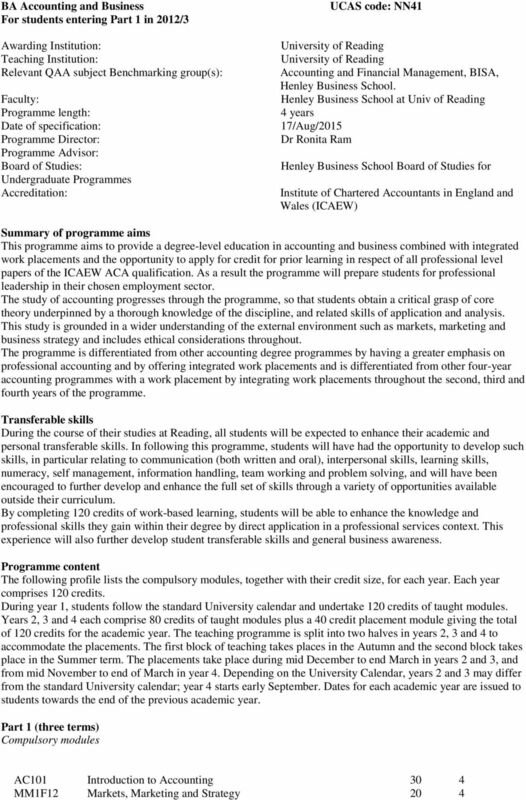 Download "Henley Business School. 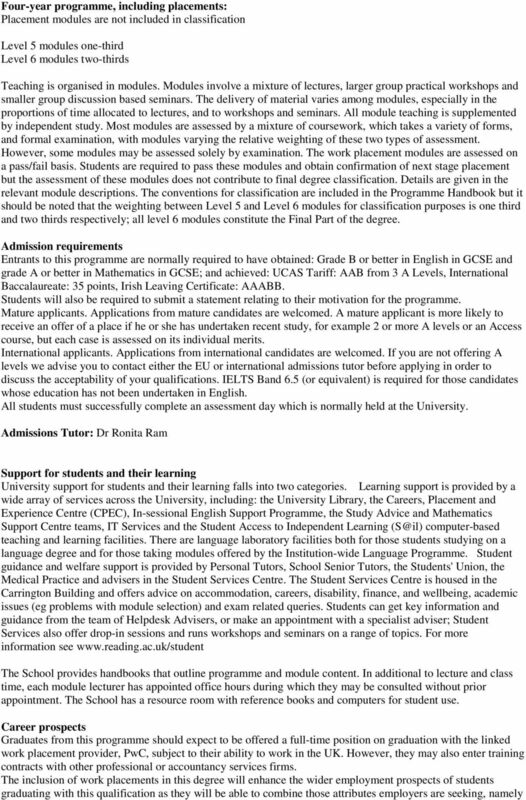 Henley Business School at Univ of Reading. 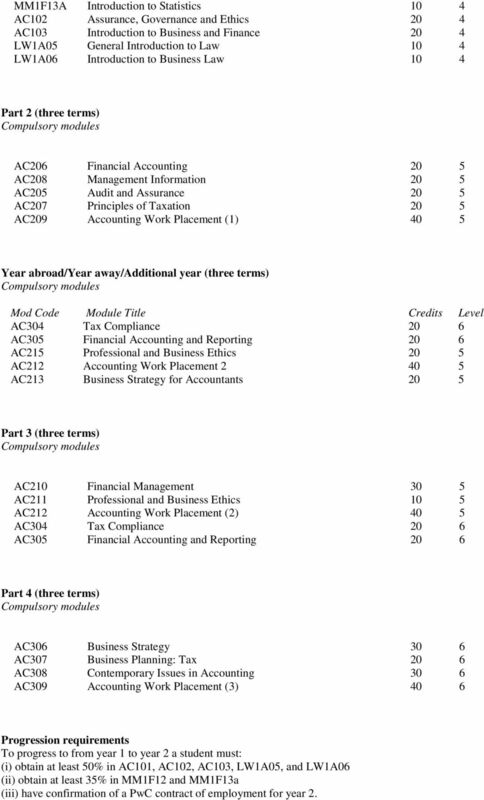 Henley Business School Board of Studies for"
2 MM1F13A Introduction to Statistics 10 4 AC102 Assurance, Governance and Ethics 20 4 AC103 Introduction to Business and Finance 20 4 LW1A05 General Introduction to Law 10 4 LW1A06 Introduction to Business Law 10 4 Part 2 (three terms) AC206 Financial Accounting 20 5 AC208 Management Information 20 5 AC205 Audit and Assurance 20 5 AC207 Principles of Taxation 20 5 AC209 Accounting Work Placement (1) 40 5 Year abroad/year away/additional year (three terms) Mod Code Module Title Credits Level AC304 Tax Compliance 20 6 AC305 Financial Accounting and Reporting 20 6 AC215 Professional and Business Ethics 20 5 AC212 Accounting Work Placement AC213 Business Strategy for Accountants 20 5 Part 3 (three terms) AC210 Financial Management 30 5 AC211 Professional and Business Ethics 10 5 AC212 Accounting Work Placement (2) 40 5 AC304 Tax Compliance 20 6 AC305 Financial Accounting and Reporting 20 6 Part 4 (three terms) AC306 Business Strategy 30 6 AC307 Business Planning: Tax 20 6 AC308 Contemporary Issues in Accounting 30 6 AC309 Accounting Work Placement (3) 40 6 Progression requirements To progress to from year 1 to year 2 a student must: (i) obtain at least 50% in AC101, AC102, AC103, LW1A05, and LW1A06 (ii) obtain at least 35% in MM1F12 and MM1F13a (iii) have confirmation of a PwC contract of employment for year 2. 7 one aspect of independent learning. Time management is essential for the timely and effective completion of the programme and the assessed work components therein and is learnt through the management of various deadlines for submission of coursework. Career planning is embedded in the work placement modules. 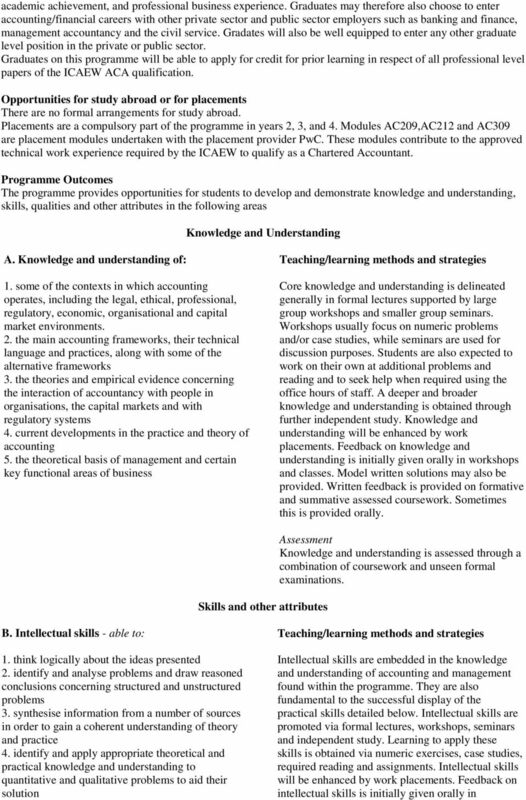 Transferable skills 1-6 are assessed through coursework. 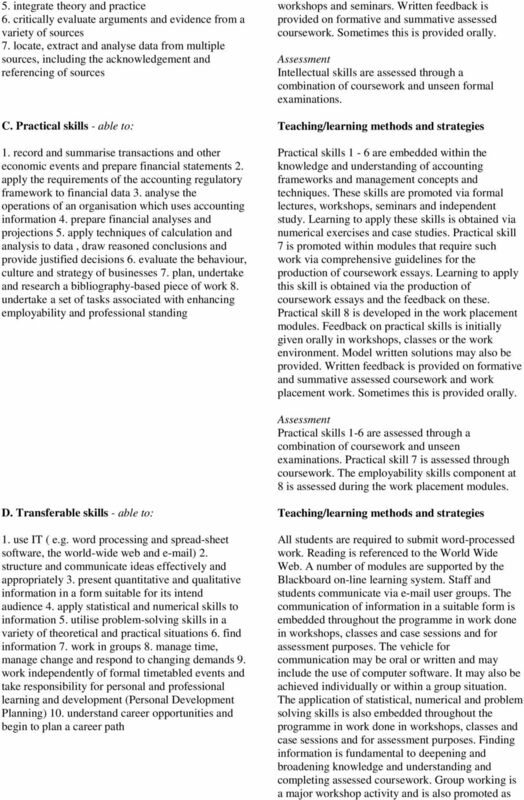 Transferable skills 7-9 contribute to assessment but are not assessed directly. 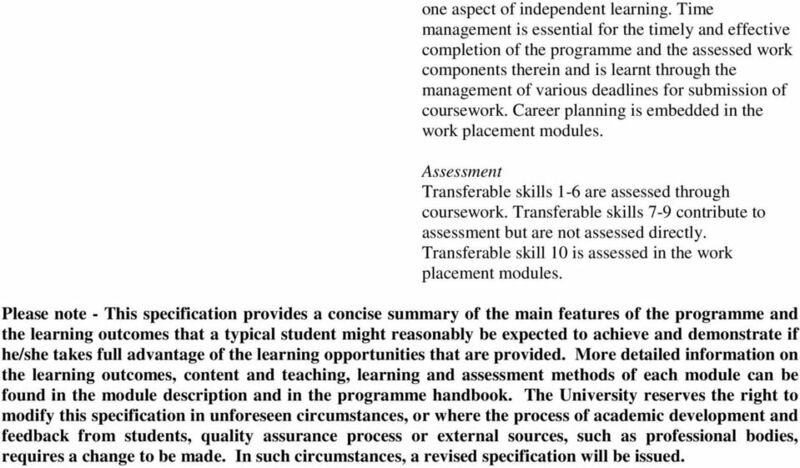 Transferable skill 10 is assessed in the work placement modules. 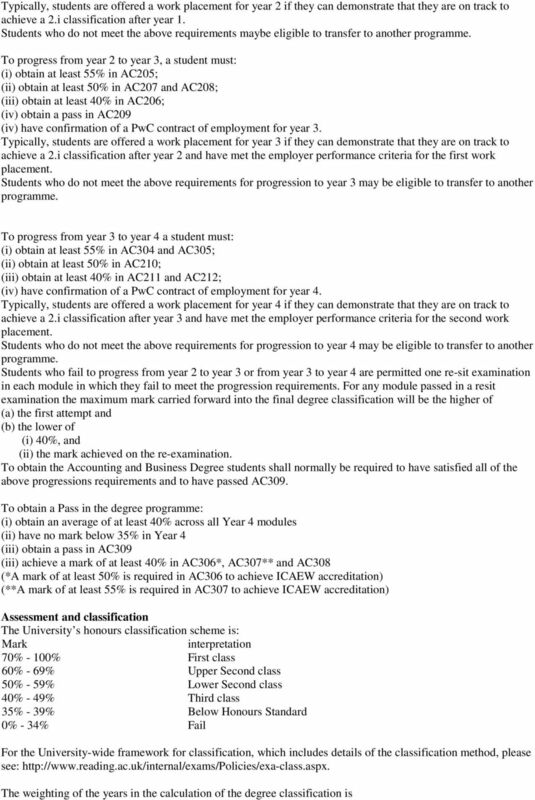 Please note - This specification provides a concise summary of the main features of the programme and the learning outcomes that a typical student might reasonably be expected to achieve and demonstrate if he/she takes full advantage of the learning opportunities that are provided. More detailed information on the learning outcomes, content and teaching, learning and assessment methods of each module can be found in the module description and in the programme handbook. The University reserves the right to modify this specification in unforeseen circumstances, or where the process of academic development and feedback from students, quality assurance process or external sources, such as professional bodies, requires a change to be made. In such circumstances, a revised specification will be issued. This Part is carried out in China and is exempt from classification for this programme.